Like someone said before, if you're making the paypal still going on for the extra content, make sure it's easy to notice and not only show how much towards the next goal is, but also how long until you stop using paypal. Heck yeah, this got funded. That's awesome :) I'm just sad I couldn't put more money towards it, but I'm currently attending my third year at university so I was kinda strapped for cash. Still, this is excellent news! Make the best darned Shantae game yet, WayForward! Is there any way we could see the other stretch goals as DLC post-release? I really want to see Nega-Shantae! This is SO AWESOME! I'm so glad we've reached an extra chapter! that's one more transformation to add into the game!! I really hope we can reach Hero mode with PayPal. I'll keep awareness up for as long as you guys keep PayPal open, with some luck we'll get you that extra 90 000$ needed! C'mon paypallers - If you get us to the 900k stretch, I'll be very very happy! You're very welcome and THANK YOU AND CONGRATULATIONS!!! This series has come a long way since 2002. The next 12 months will be exciting I'm sure. GENERAL Voldi Way, SIR IvanSmith, Jake Virt Kaufman, Jeff Luke-anticipating that Regular Show game!-, Christina Vee, Jesse-voice of Linda Lash, Erin Bozon, MASTER MATTHEW ODDESSIUS BOZON and everyone at Wayforward thanks for making my kind of games. All the best, I hope to do some work for you one day. 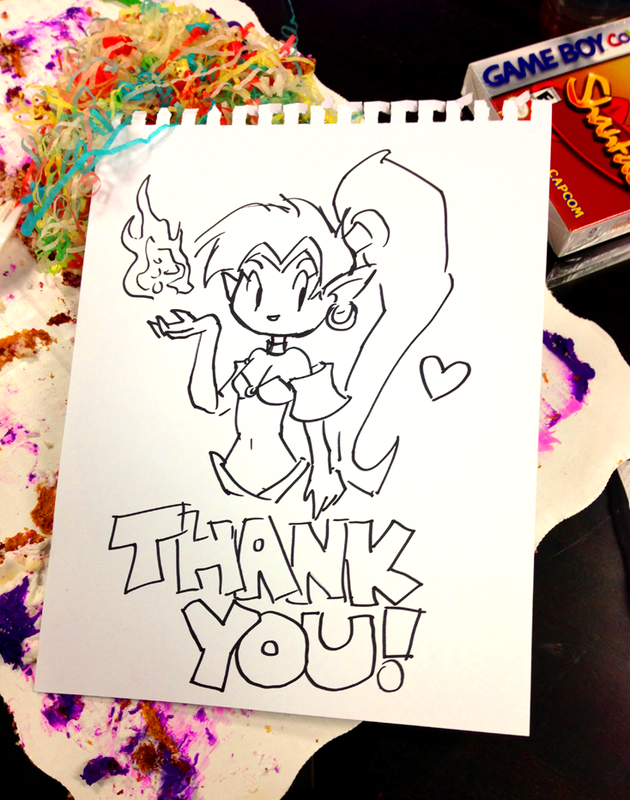 ps- Craig Harris, if you're reading this you spread interest of Shantae so IGNpocket readers like myself. THANK YOU wherever you are. HELL YEA! We did it guys! Congrats WayForward! Shantae takes me back to my childhood on the GBC so I'm defenitly looking forward to seeing this game up for sale. It would have been awesome if we made it to having Sky, Bolo, Rotty as playable characters. Ah well, we've got plenty of enough stretch goals funded already so this will be fantastic. Good luck way WayForward, and to all you Backers out there give yourselfs a pat on the back for me. Congratulations, and while I didn't have Scrooge's multiplujillion dollars, I'm glad I could help at all. Wayforward, in my opinion, is the salvation of quality gaming. May good fortune come to you for all time. Congratulations! Can't way to play this next year! congratulations wayforward, i played some of your games and loved them, looking forward to this one ! If Risky's Revenge had gotten up on Steam I am sure this would have done much better but I am still very happy with how this turned out! I was afraid we wouldn't even make 600k so that is way more than I hoped for. Hopefully you'll get rest 400-500k gathered via paypal and then I can truly say, money well spent. Honestly, thank you guys so much for giving us such a fun experience; one where we can push for a game, along with a development team who shares our feelings, and pour our hearts and souls into a character we all love very much! This Kickstarter, the amazingly fun live streams on Twitch.tv... Thank you for all that you have done and we are all so proud of you! This game will be filled with your love for Shantae and your love for creating amazing games, and every fan and newcomer is going to feel that! Good luck in the development process and I'm sure everyone can hardly wait for what's to come! Get some rest from those long 24 hours! You all deserve it!! Congratulations Wayforward, I bet we can make 900K... or even 1.3 MILLION once people hear about this success and the Paypal feature! btw your link to your website has a typo when clicked, says "wayforwrd" instead of "wayforward", hope that helps. Congrats again! THANS all around!! Maybe you guys should try to treat the Paypal funds almost as if the KS was still ongoing. Leave the Paypal totals posted somewhere on your homepage along with the stretch goals, and continue to mention the funding in your news and blog posts. It's hard to think that Shantae fans might have overlooked this campaign, but maybe leaving these blurbs during the release of Pirate's Curse could help. Sorry forgot to put 3DS on my last post. Stupid fingers. @Kevin T.J. Brown I'm cracking up over here, and my sides have left the building. I'm glad WayForward has a sense of humor about it. I really want to see a "special than" section of the credits. Maybe have Risky come out and shoot off the k and s so people who aren't in on the joke aren't completely confused. @kuppy Let's ALSO celebrate by making a new version of Risky's Revenge so we can play as Dancer Shantae. Cause...god dang she is beautiful in that outfit. Our work here is not done. We can relax and celebrate today, but it will take more exposure, time and money to reach all the way up to 1.3 Million. Paypal is open for business and there is still stretch goals to be reached. Rest today, work tomorrow! @ Kuppy I'm hoping for a pre-order sale of upcoming 3DS Shantae as I already own the previous Shantae VC games when they were first released for 3DS! I wonder how many copies Capcom sold of the GBC version of Shantae originally. So far WF is guaranteed to "sell" at least 18,500 copies of HGH!!! I second @Kuppy . A sale on the Shantae games would be perfect now that Curse is coming out soon. Let's celebrate this success with a sale on the Virtual Console and DSiWare games? Anyway, very happy you made it that far, you earn it and did a very well job. Congrats to the team! I know this game is going to be a fantastic piece of art. Congratulations to the WayForward team and to us. I hope we can make it to at least A Dish Served Cold by the time the PayPal ends. Than you everyone! Haha I think that either their keyboard broke or they're still recovering from the live stream. Make sure you guys put THAN in the game somewhere! Hooray! We did it! I'm so glad it was funded, I was honestly a little sad and worried at first. Then that awesome push came in and it blew past the goal! I'm very happy now, looking forward to the game! where do we find the paypal? Can we still get the game? I've been keeping up and blogging about your Kickstarter since day one, and had a really fun time doing so. I'm glad this Kickstarter has introduced me to the Shantae games, and I look forward to hearing more about your progress. :/ Dang it, I really wanted to play hero mode..I really hope they try their hardest to make Hero mode available, that was the stretch goal I was waiting for. HUZZAH!!! i have funded this one AND the Mighty No. 9 game!!! We did it! Congrats WayForward, and well done for all of us! Sweet, and PayPal will stay open. This means there is still a chance to make this the best Shantae game ever. Let make it happen! This was one of the more fun campaigns. ^_^ - Looking forward to following the actual development of the game!